This is the first edition of 19th century guitarist/composer Ivan Padovec’s Second Concertino for terz guitar, 2 violins, viola and cello. 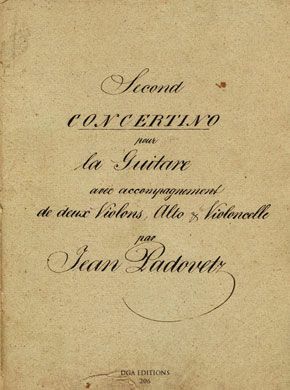 The manuscripts were discovered in the collection of Karl Scheit, one of the most important guitar teachers and publishers in the latter half of the 20th century. The cover of the edition is a color reproduction of the original manuscript.